Periya tirumoli – Naalaayira Divya PrabandhamOdhi naamang kuliththu uchi tannal olimaamalarPaadam naalum panivom namake nalmathalinAatutaaraan enilum tarum anriyum anparaayPothum maathe! Toluthum avan mannum pullaniye. -Tirumangai Alvar This is one of the 108 divya desams consecrated (mangala saasanam) by the Alvars. The two important festivals are the Brahmotsavam in the month of Panguni to Adi Jagannathar and Rama Jayanthi Utsavam in the month of Chithrai. Besides during Vaikunta Ekadasi, Krishna Jayanthi, Pongal, Deepavali, and also in weekends devotees throng the temple. 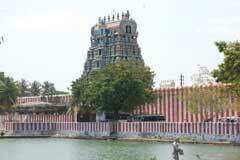 Tirupullani is one of the celebrated 108 Vaishnava temples. Sri Rama graces in a reclining form. The Bodhi Tree (Arasa Maram) dates back to centuries said to have been graced by the darshan of the Lord. The temple is open from morning 7.00 clock till 12.30 noon and from 3.30 to 8.30 pm. 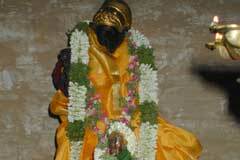 Arulmigu Aadhi Jagannatha Perumal, Tirukkoil, Tiruppullani – 623 532, Ramanathapuram District. The Brahmotsavam in the month of Panguni to Adi Jagannathar and Rama Jayanthi Utsavam in the month of Chithrai are celebrated. In these festivals Lord Jagannatha and Lord Rama appear on Garuda Vahanam. Jagannatha on the Panguni Uthiram day and Rama on the Chitra Pournami Day come out in procession. The most significant prayer in this holy place is to pray for begetting issues. The belief is that our sins will be absolved if we take a bath in the Sethu Thirtham. Moreover, all the impediments caused by the planets will be relieved if we worship here. Those who have difficulties in getting married pray to the Utsavar, Kalyana Jagannathar. The offerings include adorning Perumal with Tulsi garland, thaayar with sari and conducting abhishekams and poojas. We can also distribute the naivedyam to the devotees who come to the temple. Those who can afford, can donate to the temple renovation. Thiruppullani is a small village situated 10 kms. 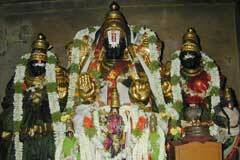 from Ramanathapuram and is famous for its ancient temple and the Adhi Sethu, the seashore. 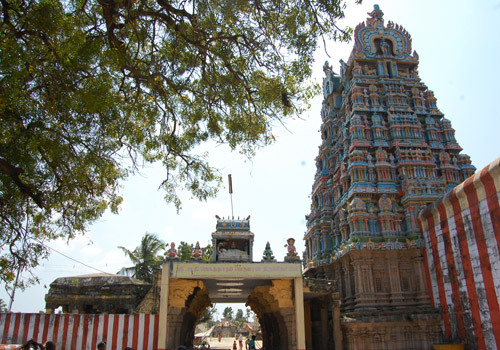 Of the 18 divya desams of the Pandya region, Thiruppullani is the most ancient and important sacred city. The place is also hailed as Pullaranyam, Pullanai, Thiruvanai, Adhi Sethu, Dharbasayanam, Rathnaakara Kshetram, Nalasethu, Saranagati Kshetram and Pullangadu. 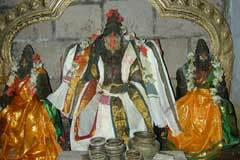 The Prime Deity faces east in the sitting posture with Sri Devi and Bhu Devi. Similarly, His Consort Sri Padmasani Thayar sits and renders Her blessings to the devotees. 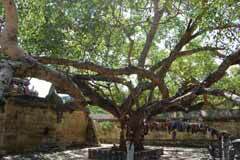 Near this shrine is the age-old Pipal (Aswatha) tree and is considered to be the incarnation of Aswatha Narayanan Who revealed Himself to the three sages, Pullavar, Kannuvar, and Kaalavar The Prime Deity is also known as ‘Dakshina Jagannathan’, installed as a salagramam by the Devas during the swayambu manvantharam. It is said that the childless Emperor Dasaratha worshipped Lord Jagannatha and received as blessings his four sons. 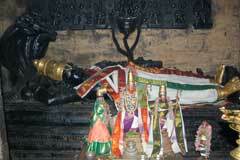 Sri Dharbasayana Ramar under the ‘Pushpaka Vimanam’ is in a reclining posture. Since he is lying on the dharba grass ( sacred grass used in the rituals), he is called so. The dwaarapaalakas (divine securities at the doorstep) installed at the doorstep of the sanctum sanctorum have majestic appearance with a domineering moustache in their faces. Such an imposing figures could not be seen in any other temple. They have hands with ‘aahvaana sign’(inviting sign) as if inviting into this unique sanctum, where the stately Rama reposes with his sword beside Him. But, He presents Himself as the Lord of Milky Ocean – from His navel arise three Lotus-stems, the center lotus with Lord Brahma flanked on his sides with Sun and Moon with head gear. Along with them sculpted on the wall are Madhu-Kaitaba, Lakshmi, Kausthubam and Sundopasundas. On the side of the crown are Garuda and Markanda. At His feet are the Ramayana personages, Sukha and Sarana, and also Hanuman enjoying the feet of Rama in a valiant posture. At the southern side of the ardha mantapam stands politely Vibishana holding the mace and on the northern side are the Emperor and his wives of ‘Mahodadi’ (Ocean) making surrender to Lord Rama. Lakshmana as the Serpent-bed Adisesha carries his Lord. The Procession-deity (Utsava murthy) is ‘Kothandaraman’ with Sita, Lakshmana and Hanuman standing respectfully as though trying to effect an alliance between Rama and Vibishana. The entire sanctum is a splendid piece, a superb sculpted tableau representing a few scenes from Ramayana. This is an exclusive presentation which could not be seen anywhere else. The shrine of Pattabhiramar has a separate flag-pole, altar, Dwaarapaalakas and ardha mantapam. The victorious Rama, after killing Ravana returns to Ayodhya with Sita in the Pushpaka Vimanam. He rests for a while at his place, where – it is said – He recounts to Sita the events that had happened during their separation. The belief is that limitless blessings will be bestowed to the devotees who worship Pattabhiramar after taking a bath in the Adhisethu. Thiruppullani is closely associated with the Ramayana especially with the incidents in the latter part of Rama’s life-history, when He goes in search of Sita. Here, Vibishana makes his ‘saranagati’ (surrender) to Lord Rama. On his counseling, Lord Rama reposing on the dharba grass for three days, requests the Samudra Raja (Emperor of the Oceans) to give way to Him to go to Lanka. The Samudra Raja does not concede to His request and infuriates Him. The furious Rama takes His bow and warns the Samudra Raja that He would dry up the entire waters. The frightened Samudra Raja with his wives rush to him and surrenders. Because of the surrenders made here by Vibishana and the Mahodadi, the place is rightly called ‘saranagati kshetram’ and since the Lord reposes on the darba grass, He is named ‘Darbasayana Ramar’. On the outer mandapam of the ‘Darbasayan Ramar’ shrine is a small shrine dedicated to Santhana Gopalan, known as ‘Nagar Mandapam Santhana Krishna Mandapam’. It is a lovely sculptural wonder. Lord Krishna sits on the Adisesha who rests on the ‘kurmam’ (tortoise) surrounded by eight elephants and eight serpents. It is believed that the childless couple will be blessed with a child, if they worship the deity offering ‘paalpayasam’ (sweet-milk porridge) to Him. 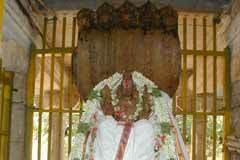 This is a famous offering in the Thiruppullani temple. Another very important sacred place is the ‘Sethukarai’, the seashore about 3 kms. from Thiruppullani. This is also called ‘Adhisethu’ or ‘Ratnaakaram’. ‘Sethu’ means ‘Bridge’. This is the place where Lord Rama built the bridge to cross over the ocean to reach Lanka, to retrieve Sita. Even today, we can see on the eastern side within the sea a long stone-way. A recent satellite photograph has proved the existence of such a causeway under the sea. This bridge was built by Nala, the monkey-architect and hence the name ‘Nala Sethu’. At the shore, there is a small shrine for Hanuman with enfolded palms facing south. He is a deity loved and worshipped by the people here. Another landmark and a small temple is ‘Chinnakoil’ (small temple) situated about 3 furlongs from the seashore. It houses Lord Srinivasa and has beautiful sculptures. On the northern side there is the white-image of ‘Swetha Madhavan’, believed to be found from the sea. This is a marvelous sculptural piece, lauded by the Archeological Survey of India. Another interesting image is that of ‘Agasthyar’, which is believed to be found from the sea. There are water-eroded marks on the knees of the image. 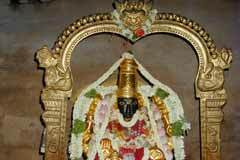 Thirumangai Alvar has consecrated this temple in 21 pacurams in the ‘nayaki bhava’ mode. 72 Chatur Yugas ago (countless crores of years), three sages Pullavar, Kannavar and Kalavar came to this temple region, then covered densely with darba grass and merged themselves in deep penance. Pleased with their penance, Lord Vishnu appeared before them in the form of Arasa Maram. Though happy they were, the Sages sought the grace of Perumal in His original form, Perumal obliged in the form of Lord Adi Jagannatha. That is the place now called Tirupullani. A shrine for Mother Padmasani was built later. This is also the place where emperor Dasaratha learnt the Mantra for child boon and was blessed with Sri Rama and his brothers as his sons. 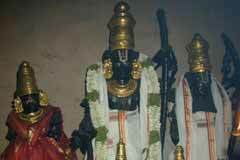 Miracle Based: Tirupullani is one of the celebrated 108 Vaishnava temples. Sri Rama graces in a reclining form. The Bodhi Tree (Arasa Maram) dates back to centuries said to have been graced by the darshan of the Lord. Tirupullani is 10 km from Ramanathapuram and 75 km from Rameswaram. Rameswaram is covered by rail route from various parts of India to the convenience of pilgrims. Hotel Ruby-A/C: +91-4567-223 042, 225 230.